Environmental pollution is the downside of our industrial society. In the past 20 years, respiratory and allergic diseases have increased more than 10 times. The Salt Room is for healing, rejuvenation and relaxation. The air environment of the Salt Room is characterized by a high degree of bacterial purity. 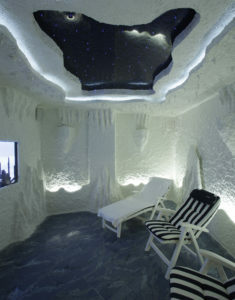 The treatment in the Salt Room helps to increase respiratory function. The improvement in bronchial function leads to the normalisation of metabolic processes, and an improvement in the central nervous and cardiovascular systems; it also reduces endocrines, and boosts the immune system. The unique combination of humidity and temperature, a constant air pressure, and the presence of air ions – sodium, magnesium, calcium, potassium, iodine – has a beneficial effect on all the vital body systems. The Salt Room is an exact recreation of a natural salt cave, complete with the sea’s microclimate. The Salt Room at the Taleon Spa resembles a tropical island paradise: procedures are accompanied by the singing of birds, sounds of the forest, the babbling of a brook, and virtualized images of nature. We recommend visiting the Salt Room for 10-15 sessions (1 session = 40 minutes). Treatment in the Salt Room is equivalent to a rest by the sea or in the mountains. Price: 40 minutes costs 2500 RUB.